Posted on September 13, 2013 | 4053 views | Topic : Foreign Property News. 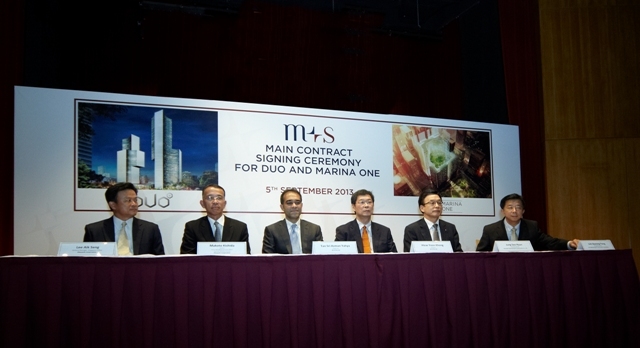 Representatives from Obayashi Corporation, M+S Pte Ltd, Hyundai Engineering & Construction Co. Ltd and GS Engineering & Construction Corporation at the main contract signing ceremony for DUO and Marina One.–M+S Pte Ltd.
Japanese and Korean contractors appointed. M+S Pte Ltd announced the principal contractors for the mixed-use developments, DUO in Ophir-Rochor and Marina One in Marina South, recently. M+S Pte Ltd is a joint venture between Malaysia’s sovereign wealth fund, Khazanah Nasional Bhd, and Singapore’s counterpart, Temasek Holdings (Private) Ltd. The company is developing the two sites as a result of 2010′s land swap deal between the two governments, which also involved the ex-Keretapi Tanah Melayu Bhd (KTMB) lands in Tanjong Pagar, Kranji, Woodlands and Bukit Timah. The two contracts, with a total value in excess of RM5.26bil (S$2bil), were awarded to Japanese Obayashi Corporation for DUO and a Korean consortium of Hyundai Engineering & Construction and GS Engineering & Construction for Marina One. 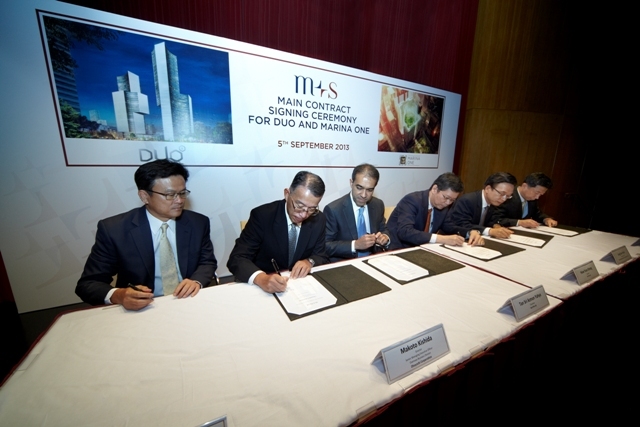 M+S Chairman Tan Sri Azman Yahya noted the appointment of the three reputable contractors marked another significant milestone for the two iconic developments as construction for both DUO and Marina One are expected to commence this year. When completed in 2017, both developments will complement and enhance the new growth areas of Ophir-Rochor and Marina South with their unique offerings, said the developer. DUO is set to take its place as the civic nexus of Bugis and as the largest integrated development within the arts, cultural and educational precinct. Marina One’s lush greenery and waterfalls in its green heart, meanwhile, will be a sanctuary for urban dwellers in Singapore’s new Central Business District (CBD). Obayashi Corporation will undertake the construction of DUO Residences comprising a 49-storey residential block of 660 units, DUO Tower, a 39-storey commercial and hotel complex and DUO Galleria, a unique retail gallery with basement carparks. The Korean consortium of Hyundai-GS is tasked with the construction of Marina One East Tower and Marina One West Tower comprising two 30-storey office blocks, Marina One Residences comprising two 34-storey residential blocks of 1,042 units, four basement levels, an underground pedestrian network and an ancillary road network. Initial piling works have been completed at DUO and piling for Marina One is scheduled for completion this year.